Whether you're designing an original scrapbook page, an exciting treasure hunt or creating your own piece of art, you'll find these Civil War themed, hand antiqued sheets of paper incredibly fun to work with. 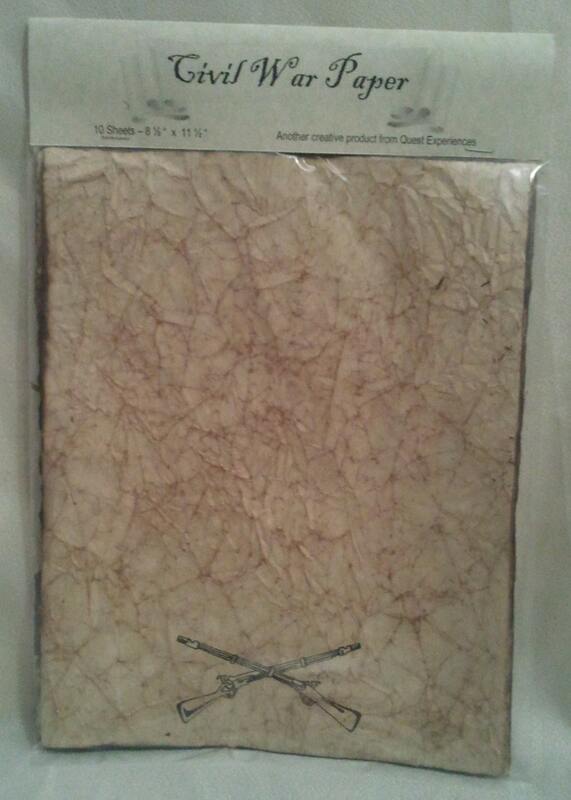 The four step aging process transforms regular parchment paper into paper that looks hundreds of years old. It not only LOOKS antique…but it FEELS antique, as well! Although it's difficult to truly catch with a camera, the second image reveals that there are subtle veins of shimmering gold worked into the page for a truly special look! These sheets feature crossed muskets on the bottoms of each sheet and come in packages of 10 and are 8 ½ x 11 inches in size. These will bring a look of real authenticity to any historical project you might be working on. View our store to see other themes including Greek, Egyptian, blanks sheets and maps!